For 29 years, the American Songwriter Amateur Lyric Contest has helped thousands of songwriters become involved in our community. Established in 1984, America Songwriter magazine sponsors six (6) contests per year that run in conjunction with each issue published. Entrants should send lyric sheet only, no cassettes or musical direction. PRIZES: The winning lyric, along with three (3) additional runners-up and ten (10) honorable mentions from each contest, will be published in the issue of American Songwriter that follows the deadline of each contest. First Place: First place winner also receives a Gibson Acoustic Songwriter Deluxe Studio EC Guitar (MSRP $3,268) and a Shure SM58 Microphone. EDITORIAL COVERAGE: One of the four finalists will also be chosen for American Songwriter’s one-page Q&A feature in the print issue and online. YEARLY GRAND PRIZE: One bi-monthly First Place winner will win a round-trip domestic flight to Nashville for a “Dream Co-writing Session” with singer-songwriter Ashley Monroe. The winner will also receive a full band demo recording session at Omni Sound Studios. * Past Grand Prize Lyric Contest winners have co-written with hit songwriters such as Lee Brice, Hayes Carll, Chris Young, Rodney Crowell, Bobby Braddock and Chris Stapleton. 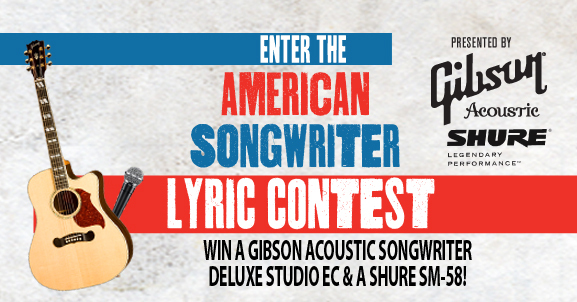 Sonicbids.com has provided the American Songwriter Bi-Monthly Lyric Contest a Third Party Submission Platform for over 4 years, making us proud to continue working with Sonicbids.com. If you are a member of Sonicbids or wish to create a Sonicbids account for other opportunities – please click the logo above to submit to this contest. Feel free to email us at: info@americansongwriter.com if you have any questions.